What may sound like a negligible statement has, in fact, significant subtext. For in this day and age, photos are everything. In terms of marketing, appearances have never been of greater importance. In the age of the internet, social media et al, the word has lost most of its value to the image. So when food is judged by its looks rather than taste, car makers could be forgiven for making their cars, and concept cars in particular, not so much eye as phone camera candy. Against this background, Mazda’s most recent tangible statements of intent, the Vision Coupé and Kei concept cars, are nothing short of a revelation. For their aesthetic quality is only truly visible in three dimensions, in the real world. Or, more specifically, it was at last year’s Geneva Motor Show, where I myself tried to capture the deep, substantial beauty of Mazda chief designer, Ikuo Maeda’s most recent creations – in vain. While unquestionably attractive in pictured form, the Vision Coupé and Kei both possess a visual quality that requires proper examination in order to be appreciated in all of its facets. 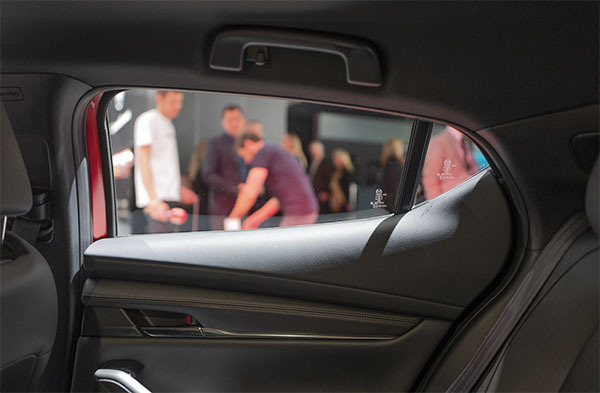 For that reason, the lighting at the show stand highlighted how changing illumination informed the cars’ appearance – consciously taking into account that this wouldn’t facilitate brilliant snapshots. This eschewing of the industry’s consensus, of ‘how it’s done’ isn’t just praiseworthy in itself, but highlights how Mazda in general go about the business of designing cars in a different way to the rest – which doesn’t just extend to concept cars. The new Mazda 3 is the production version of the Kei concept. Not having seen it in the metal, any appraisal of its design obviously comes with a distinct caveat – particularly given aforementioned limited photogenic qualities of Mazda’s most recent Kodo designs. Yet it seems highly unlikely that the reduced graphics of the new 3 have resulted in blandness à la Sensual Purity v2.0. That regrettably massive (from a practical & safety perspective), yet charismatic c-pilar – with its abstract Alfasud flair -, the delicate, intriguing surfacing and the simple and simply sublime graphics should see to that. What we are dealing with here is a mainstream car executed in distinctly idiosyncratic a fashion. Rather than trying to appeal to some abstract median clientele with this 3 (‘like a Golf, but a bit cheaper’), Mazda have chosen to create a product that will be excluded by some putative customers on the grounds of being too unusual, too distinctive, yet truly aspirational to others. In that sense, it won’t necessarily be ‘premium’, but certainly exclusive – just as an Alfa Romeo or even a BMW used to be, back when both brands stood for something other than a glorious past. That this stylistic determination is backed up by unusual engineering choices (normally aspirated engines, a focus on driver engagement, rather than electronic nannying) also serves to illustrate how Mazda have sharpened their focus since having regained independence from the Ford Motor Company empire. Trying to please everybody is a recipe for mediocrity. Mazda, due to a combination of necessity and ingenuity, have obviously realised that they cannot afford this. And that pleasing actual observers, rather than Instagram, is a luxury they must afford. Eventually, more automotive brands will come to realise too that there is no pleasing everybody. Either that, or they’ll face vacuity first – and then extinction. I don’t like the current Mazdas but agree that at least they’re individual. On the 3 the rear door window is far too small and the rear door also has a rear shutline that doesn’t work. Front and rear door handles are pointing in different directions giving the impression that something has molten and resulted in this misalignment, an impression amplified by the strange wavy door skins that also look like they were molten. The Vision Coupe really is quite something. If the next 6 looks like that in the way that the 3 relates to the Kei, then Mazda could have one of those rare things on its hands, a truly desirably designed saloon. The last time I felt like that about a saloon it was the Alfa 156, and the Vision, in concept form at least, has even more allure than that. Back to the 3, that C pillar and the accompanying DLO really is divisive. I find it even divides my own opinion. Sometimes it irks (more to do with how sharply the lower edge of the DLO cleaves upwards into the C pillar, when viewed from side-on, I think). Other times, it looks bold and inspired (mainly from the rear or front 3/4 views). I haven’t seen the car for real yet, but the surfacing – especially in the Soul Red Crystal hue – is beguiling. I note Dave feels differently and I can see why that might be the case. However, that the surface treatment gives the 3 hatch real individuality and, hence, means that Mazda has a compact class car which really stands out and I think, most people will find, in a good way. Like you, I find it difficult to come to a final conclusion regarding the c-pillar. Like you, I also appreciate the fact that Mazda knowingly went for a possibly controversial option, rather than continuing with the triangular design that had featured on the previous 3s. Regarding the surfacing, I must repeat that – certainly in the Vision Coupé’s case – photos do not do the craftsmanship justice. Not even remotely. If even just half the surface magic showcased on the concept cars is apparent on the production cars, we’re in for a treat. Christopher, I’m really looking forward to seeing the new 3 in the metal, particularly after reading your comments. Even in photographs, the surfacing looks very interesting. The design is delightfully pared down and lacking in superfluous detail and ornamentation, from which I would infer that the designers are very confident in what they have created. I’m also really pleased that they avoided the obvious temptation to use a “hidden” rear door handle. The “cab backwards” stance is very unusual for a FWD hatch, and the better for it. Most of all, the fact that it could never be a Focus or Astra, or even a Golf, only adds to it’s appeal for me. The rear side panel has a convex calotte-like surface and the door shutline cuts this calotte in a straight line and even goes through the ‘rim’ of the wheelarch cutout instead of following it in a parallel circular line. The rear door handle is horizontal and the front one is pointing downwards at front. This is what I’d call careless design with lack of attention to detail and this never would have happened to the folks that designed the Golf Mk4. The kink in the rear door window makes looking out in tight urban conditions unnecessary difficult – just imagine going around an Italian roundabout with motorini all over the place. There surely would have been a way of putting the kink in a third window in the C-post. Hi Dave, regarding the door handles, I don’t think that’s carelessness: I think there is a subtle, almost implied, rising arc from the trailing edge of the front wheel arch and both handles appear to be aligned on that arc. Regarding the rear door shut line, yes, it is a bit uncomfortable but, in mitigation, the shut line is exactly parallel to the bumper to wing shut line. As to the visibility issues, you’re probably right but it would take a drive to confirm the extent of this, as appearances can be deceptive in this regard: I was surprised how poor the rearward visibility was in the Volvo V40 and the previous generation Qashqai when I drove them, as both had large third lights in the C/D pillar. In any event, different perspectives are always interesting. Moreover, I have high expectations but may be disappointed with the reality! The change between concave and convex surfaces together with the unhappy shutlines makes the door skin look as if it were made from aluminium foil and would distort and flutter in the wind, taking the door handles with it. Hardly an impression of quality. Might I add that the new Ford Fiesta has a luscious surface quality that photographs don´t capture. I was stopped in my tracks the other day by a parked Fiesta in almond green. Together with the brightwork it had the feel of a 1960s classic car without being remotely retro. Beauty was the word for it. Are you sure it wasn’t just the fact that the Fiesta was a hue of green that stopped you in your tracks? Probably Bohai Bay Mint Green. The colour impressed me and I think showed off the magnificent surfacing. I´d noticed the richness of the surfaces on a metallic red example some weeks back. The Bohai Bay Mint green is even better. The linked photo does not capture the effect very well at all. I am surprised at being so surprised and it makes me think I need to be more careful about passing judgements on cars based on photos. In a couple of months, we’ll all be able to decide what this 3 hatchback looks like in the flesh when it canters into dealers. Not that it bothers me beyond aesthetics; I’m not a hatchback man. After my test drive of the GTI Mk 7, when the salesman turned to me expecting me to be in otherwordly rapture, I felt distinctly unmoved. I then looked at the tiny luggage compartment and wondered at all the authors who keep telling me how large it is. Much rather have a trunk personally. The Golf wasn’t a patch on my Subaru Legacy GT AWD – no brio. No sale. And the new Mazda3 saloon DOES photograph well and you can get AWD cheap – I need it, frankly. It’s Cdn$28K plus our semi-VAT 15% with the 2.5l engine GS model and all the electronic nannies. (A further $4K gets sunroof, radar ACC, swivelling headlights, HUD, leather, parking sensors and other frippery) A 1.4t Golf from Mexico that doesn’t look like a fleet special inside is over $30K! I mean, no contest, but with the caveat – I haven’t driven the new 3 yet and neither has anyone but autojournos. Maybe it’ll be awful, but what’s the chances? The Mazda6 turbo is sublime but stuck with only front wheel drive and too much torque for two tyres. The current 3 drives wonderfully except for noise levels and abrupt suspension toss on bad frost-heaved roads, both supposedly addressed in this new model. The point is, whether you blow rose petals or hurl stones at the new 3, at least Mazda is trying for a real theme beyond giant fake air intakes and exhausts, creases, chrome overload, and dare I say it? – a certain vulgarity that most makes embrace. That’s the point, surely? Somebody is still actually trying to design organically, whether successfully or not in sales terms. They deserve a nod of respect. In 10 days time, we’ll get to see the new Subaru Legacy at the Chicago Auto show. Sure as I’m sitting here typing, it’ll look like a wet dog, unfortunately. Enjoyed your article so much. It’s not everyday that such a clarity of context can be expressed in so concise a manner. It is clear that Mazda is taking a bold styling direction that promises a lot, and is threatening to radically shatter the empire of styling boredom that threatened the industry during the past couple of years. The essence of the Mazda 3 Hatch’s striking, iconoclastic appeal is probably in its daring approach, one of ‘proportion arrogance’ (for want of a more civilised way to put it). drive-to-drive passion that its styling exudes so ‘easily’. without its crucial threedimensional aspects). I find this, slightly disturbing, nonchalance with which it displays the said arrogance of proportion, to be a result of a significant, possibly epic creative journey that the Mazda styling men have undertaken – and which tends to be somewhat underappreciated. That’s why I feel the need to elaborate on this. of the defining aspects of this design. the radar of scrutiny as a ‘correct, sensible choice’, and yet to retain such immense reserves of ‘visual power output’ for those of us that are fed up with the predictability and try-not-to-yawn-challenge of the contemporary automotive styling horizon. and shines through this game-changing (I think this is the word) design. Of course, electing to market a C-segment car that’s so daring in its visual language, is undoubtedly a somewhat risky move. But if viewed together with the overall “I’ve had it” effects of the recent trends, it adds up to the new 3 Hatch as a design that’s also perfectly timed with the trends/developments. This adds a potentially very significant dimension of this refreshing automotive news that the Mazda 3 Hatch appearance indisputably is. Yes, but couldn’t the lamb chops have been prepared with a touch more delicacy? Perfect for little ones suffering from photo dermatitis. I was at the Mazda dealer yesterday Feb 28, to compare the CX-5 with the Volvo XC40 I’d just been in. The latter was a huge disappointment to me – cheap interior and fittings, generic cloth on the door card, a driver’s side door armrest so short due to forward placement of the B-pillar that my elbow kept slipping off it, and to cap it off, it’s higher than the centre console armrest. Tilt. Wrote that thing off in ten minutes -it’s highly overpriced to boot. Volvo are in the dumps for reliability as well. What really caught my eye was the new Mazda3 hatch in machine grey metallic with tan leather interior. Wow! I never was a hatch person, but this car is gorgeous and all the professional squawking above in the comments means nothing when something just grabs you like that. I can even get in and out of it without contortion – didn’t try the back, I’m retired, couldn’t care less. The driver is coddled and all I felt was surprise and delight. The view to the rear isn’t bad, much like my old Audi Coupe and anyway there are blind spot warnings in the mirrors. The finish was superb and the driver seat cushion is not some Japanese shorty with no thigh support. AWD for my winter woes is available in the next two months. If it drives decently, I may have to get one. The saloon is nice but bland and the interior is much the same style but there are no tan or wine-red interior options for it, just black or white. I then drove 10 miles to the Audi dealer to see if my recollection of the contortions I had to go through just getting out of an A3 was correct. I’m afraid it was. The Golf is the same. Sorry, the B-pillar is about 3 inches too far forward in those cars, and that’s that. The interior is also not up to that Mazda3 either, not even close. Audi flat plastic is dull, the grained areas generic and it looks dusty even in the showroom. Seats were similar in squab length and first try comfort. The A3 is 50% more for a reasonably well-specced car, but simply doesn’t have the features the Mazda3 has standard no matter how much one pays. It is more powerful and that’s it. I like that Mazda3 a lot. Now I just have to wait and see how it drives with AWD. I don’t think Mazda is striving for family use, more of an upscale replacement for those old two door personal cars, a bit of style and a happy driver. Next Next post: Do Want Your Liver Back, Clever Man?